We recommend Duette Triple Honeycomb shades over the Double Honeycomb for extra insulation against the cold. You might be surprised to learn that we do not recommend the triple honeycomb over the double in this instance. The answer is FALSE. Out of a rating of 5 stars, double honeycomb receives a 3 and a triple honeycomb 3 1/2. The added cost of purchasing the triple cell shades are not a good bargain. Plus these shades are very heavy and often require extra service for string replacement. Now the triple is rated much higher or 4 1/2 stars for heat control but not cold control. The best honeycomb on the market for insulation value is still the Duette Architella Opaque, (black-out) rated a full 5 stars or the Semi-opaque rated at 4 1/2 stars. Architella is now on sale and so is the regular Duette honeycomb.You get a rebate of $25 off each Architelle and $20 off each Duette. 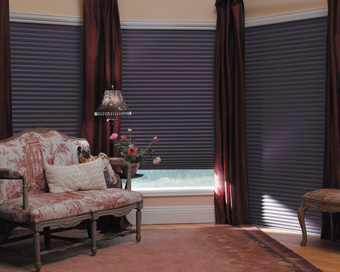 There is a catch, you have to order a minimum of four blinds in any combination of the two products. You will receive your rebate in the form of an American Express cash card. We will assist you with your paperwork. We have issued many rebates and everyone has received their card. Call today for an appointment, or email us your measurements for a bid. We require an on-site measure before final order is placed. You can see the blinds in our showroom off of Hwy 3 in Allyn.